June 1986. Switzerland. We took my mother on another trip to Switzerland. This time to stay at Zermatt and to see the Matterhorn. Went up to Gornegrat by rack railway for a view and then on another day went on the cableway to Scharzee to see the magnificent view of the Matterhorn and the whole length of the Gorner Glacier. We walked for miles and miles. My poor mother who was 70 somehow kept up with us. September 1986 – Aegean Cruise. We decided to take another cruise with Swan Hellenic. So on 16th September we flew to Venice where the ‘Orpheus’ was berthed at San Basilo. We embarked at 3 pm. It was a glorious day. Our cabin was D32, small but extremely comfortable. Porthole, beds on either side, wardrobes, lockers and bathroom, consisting of a shower, basin and toiletry cabinet. We were served with tea on deck and then the ship sailed down through Venice, past the Doges Palace and out to sea. What a wonderful start to the trip. We spent the whole of the next day at sea on our way to Katakolo, a day filled with lectures on what lay ahead and just wandering around the deck getting to know our way around and being fed delightful meals which ended the day with a Gala dinner after the Captain’s Cocktail Party. The Orpheus had a great idea of mixing people up. When you went to the restaurant they escorted you to a table where you were seated with complete strangers, this way you got to know almost everyone board by the end of the voyage. Of course there were small groups who stuck together but I think they lost out on the swirl of meeting some very interesting people, though I have to confess there were some duds. You knew almost straight away that you had nothing in common and sometimes it was made it clear that your dining companions would much have preferred a married couple rather than the two of us. More fool them. Sad how these incidents only occur with British people. During the next morning we sailed in the channel between Cephalonia and Odysseus’s island home Ithaca, during which we had a talk over the Tannoy system while everyone was on deck. Just after lunch we reached Katakolo and boarded coaches to Olympia. Glorious weather, which remained throughout the trip. We had visited the site before and it was just as breathtakingly beautiful, very lush with a dream-like quality shaded by evergreen oaks, pines and olive trees. Had a very good talk from the guides and then were free to wander around the ruins. as we had visited the site earlier we took a leisurely stroll among the ruins and spent a great deal of time in the museum. Mistra. The next day (18th September) we berthed at Gythion to visit the Byzantine ‘ghost town’ of Mistra. Many churches, monasteries and houses lining its winding streets. Many containing wall paintings which seemed to our eyes rather crude and frankly the whole place left us cold. The only memorable church was the Pantanassa (late 14th century) with a few good wall paintings. What a disappointment after yesterday. They served us with a picnic lunch. and we rejoined the ship in the late afternoon, in time for a splendid tea. That evening the sea was like glass with a moon glinting in it. There was no wind, everything very, very still. The storm. The following day we were to visit the islands of Paros and Naxos. We never did. During the night we were caught up in a terrible storm. The first thing we knew about it was when everything fell off our cabinets and crashed across the floor of the cabin, the next thing we were aware of was that the curtain at the porthole was standing straight out into the cabin and we found ourselves in bed standing upright on the wardrobes at the foot of our bunks, a very strange sensation. The whole ship creaked and groaned as it rose up into the air and came crashing down. We thought we were likely to go down and surely the ship would not be able to survive such a buffeting. Terrified we lay in our bunks expecting the call to the lifeboats at any moment, but strangely, somehow, right in the middle of the storm we both fell asleep and only woke up when our clock alarm, which was lying on the floor, went off in the morning. The storm was still in full spate and the boat was still rising up into the air and coming down with a crash. Somehow we staggered to breakfast, but I soon gave up and though William continued with his; he never gets seasick, I fled to my bunk and lay down, it being the only way I knew to deal with sea-sickness – lie down before you begin to retch. Meanwhile the ship could not berth at Paros as it was impossible to enter the harbour. The captain then announced that he was searching for an island with a harbour which he could enter, something to do with the alignment of the harbour entrance with the wind. Anyway, just before lunchtime he found the Island of Syros and we disembarked for the day. Delightful island in the centre of the Cyclades, but bereft of any of its ancient remains. A small museum of three rooms with virtually nothing in it apart from a phallic idol. We wandered about for the day, had lunch on board where we learnt that all shipping had been halted and even the ferries would not be leaving the harbour as long as the storm lasted. However, the Captain informed us that notwithstanding the storm and the warnings he had had, we would be leaving shortly after dinner on board that evening in our safe haven in the harbour, as he had to reach our next destination no matter what the weather. He advised everyone to retire to bed once we had dined. This we did. The ship then sailed out of the harbour and hit the full brunt of the storm; no wonder Odysseus had such a hard time returning home. Up and down went the ship, you could feel it rising, then there would be a pause with every metal bolt straining, when we seemed to hang in the air, and then it came crashing down with an almighty thump. We lay there terrified, wondering if we should get dressed and wait for the call to abandon ship, but somehow, goodness know why, again we both fell into a deep sleep in the middle of all the rumpus and woke the following morning to a calm sea, a blue sky, in fact a beautiful balmy day and found we had berthed in Kusadasi in Turkey. We left by coach for Ephesus. On the way we stopped to view the sad ruins of the Temple of Diana/Artemis. Once one of the Seven Wonders of the Ancient World. What a sorry sight. One single battered, re-erected pillar sitting in a muddy swamp of weeds. The first temple was burnt to the ground but the Hellenistic temple which replaced it was the Wonder. Pliny described the temple’s forest of columns, 127, the whole embellished by the greatest sculptors of the age, including Scopas and Praxiteles. The Romans stripped it of its treasures, the Goths had a bash at it, the Christians abandoned it and used it for building material as did the Ottomans. What remained was lost to silt and its existence forgotten. The site was only discovered by John Turtle in the 19th century. We ploughed onto Ephesus, everyone rather shaken at what we had seen. Ephesus. We entered at the Magnesian Gate and walked downhill along the main street. Ephesus was renowned for the fact that it had a sheltered harbour. Even though we were standing on the top of a hill overlooking the city there was absolutely no sign of the sea. Apparently it has silted up to such an extent that it was quite impossible to think that there had ever been a harbour at Ephesus. Apparently there is now 5 kilometres of silt. It is an extraordinary feeling walking down the main thoroughfare of Ephesus which had been there since Neolithic times. The Goths destroyed the city in 263 BC. And though the Emperor Constantine rebuilt it, it was finally destroyed by an earthquake in 614 AD. The Hittites owned the city, then the Greeks, then the Romans, then the Byzantine emperors and finally the Turks. St Paul visited as did apparently St John and took care of the Virgin Mary during the last years of her life. Most made their incredible mark on the city. The sides of the street are a bewilderment of ancient classical ruins. The most discernible ruins are Hadrian’s Corinthian Temple, and the Scholastikia Baths behind the Temple which was built in the 1st century and restored in the 4th century by a lady called Scholastikia. One of the main breath-taking sites is the Library of Celsus which forms a backdrop to the silted harbour. It has been hugely restored. It was erected in 110 AD, as a monumental tomb for Celsus the Governor of Asia, and at its height it contained 12,000 scrolls which were kept in rows of niches in the walls of the inner chamber. However it is the magnificently restored frontage which makes one gasp with its pillars and statues in niches. It was badly damaged by the Goths, was then destroyed by a mob led by the archbishop of Constantinople in 401 AD and finally it was brought to the ground by an earthquake. The reliefs which once adorned the building were nicked by the Austrians and they now grace the Ephesus museum in Vienna. We later we saw them in Vienna and they are magnificent. We then walked down the marble Arcadian Way which leads to the Graeco-Roman Theatre. This is where St Paul blasted off against false gods, particularly poor Diana which would lead to the eventual abandonment and destruction of one of the Seven Wonders of the Ancient World. The Taliban are worthy destructive successors to the early Christians. The theatre was begun in the 3rd century BC but was added to during the reigns of Claudius and Trajan. It had seats for 24,000. The Marmorean Way and the Acardian Way which lead to the silted harbour, are two of the main thoroughfares in Ephesus and are lined with monumental marble pillars. We saw a great more than shown here. The ruins are a truly quite staggering sight. Didyma. We returned to the ship for lunch and then set off by coach for Didyma, quite a long journey, to visit the Temple of Apollo, which like Delphi, boasted an oracle that was in hot competition. Unlike the one at Delphi this oracle wrote down all its prophesies in classical hexameters no less, one of its pronouncements gave the OK to the Emperor Diocletian’s persecution of the Christians. The original temple was begun at the end of the 8th century BC and finished about 560 BC. It had a total of 104 columns and contained at its heart a sacred spring and an olive tree, a very successful oracle and a bronze statue of Apollo. In 494 BC the temple was destroyed by the Persians and its treasures and its statue of Apollo were carried away and the spring dried up. Enter Alexandra the Great when the sacred spring gushed again and the oracle, who must have been still around, correctly predicted a victory for him. The Persians, who had been defeated by Alexander, returned the statue of Apollo to the temple. The Hellenistic Temple which can be seen today was built around the site of the original temple and is jaw-dropping in size and majestic splendour. There were two rows of 21 columns at each side and another two rows of 10 columns at the front and back. Built on a high platform there are further set of columns. Altogether 120 columns, only three of which are standing and there are stumps for the remainder and toppled ones all around. There are a pair of marble passageways, built into the walls of the temple, which lead down to the centre of the temple, the cella, which has no roof. In the cella was a small temple in which sat the statue of Apollo presiding over the sacred spring and the oracle. The main Temple of Apollo had a frieze of massive Medusa heads. There is a giant toppled Medusa head from the frieze which lies on the ground and demands that you photograph her. What is it about Medusa’s head? We keep meeting her everywhere in the ancient Greek and Roman world. The temple if completed would have been the largest temple in the Hellenic world – we keep being told that. Unforgettable place and is now surrounded by a small humdrum sleepy Turkish town. Miletus. We then coached to Miletus, not a particularly pleasant site covered in thorny shrub, in a muddy wilderness. It is an ancient Greek city which had its heyday in the Hellenistic and Roman periods. In antiquity Miletus possessed a harbour which was visited by St Paul. The harbour silted up. We were led to the Hellenistic Theatre for a short lecture. Massive but looking very neglected. Apparently it could seat 15,000 people and much of the seating is well preserved. In the centre of the front row are two columns, which with two others held the baldaquin over the emperor’s chair, presumably it cut off the view of everyone behind. We took a desultory walk among the ruins which appeared to be very neglected and the thorn bushes and mud were a problem. The massive gateway to the agora was bagged by the Germans and now sits in the Pergamon Museum in Berlin. If only the Turks would look after the site. If we had anything remotely like this in Europe it would be a ‘must see’ place. I blame ourselves for not seeking out the some of the more prominent ruins but I think we were by now very tired and replete, and we only have ourselves to blame if we did not investigate the site with more enthusiasm. We returned to the ship in a state of some exhaustion, both physically and mentally. The following morning 22 September we arrived at the island of Rhodes. We had visited before. 23 September. Perge and Aspendos. Early the next morning we arrived at Antalya and took the coach to the archaeological site of Perge. Perge. Supposed to have been founded after the Trojan war by Calchas and Mopsus. It was Calchas who persuaded Agamemnon to sacrifice his daughter Iphigenia so that his ships could sail for Troy. The remarkable ruins include the almost intact Greco-Roman Theatre which had a capacity of 14,000: the stage building still standing. One Nymphaeum (below) dedicated to Septimus Severus. North-east of the Theatre is another remarkable structure, the Roman Stadium, constructed in the second century AD. This one had a capacity of 12,000, The citizens of Perge were certainly keen on being entertained. My lasting memory is of the vast colonnaded streets where most of the columns have been re-erected and where the people of Perge could be sheltered from the weather and wander about to shop and meet with friends. Most of the statuary has been removed to the Perge and Antalya Museum. Magnificent Roman sarcophagi in the museum. Side. We then left Perge for Side where we had lunch, together with what seemed like 100s of other people. The food was awful, I mean truly memorably disgusting and the public toilets were even more memorable. We went in search of the toilets and when we arrived we watched while one of the communal toilets for men was cleaned. Two men with filthy mops and brooms ran their mops and brooms over the urinal and then the filthy floor of the urinal and then went into the stalls and then as an encore, with the same filthy mops and brooms went over all the basins and taps. Lethal. We went in search of some convenient bushes and used our bottled water to wash our hands. Bit of local colour! Rather dull and dreary weather. The Roman Theatre at Side, reputed to be among the finest in Turkey constructed in the 2nd century AD. Aspendos. We then travelled by coach to the site of ancient Aspendos. Founded by the Hittites and somewhere along the line was settled by migrants from the Trojan War, it was ruled briefly by Croesus, King of Lydia and then fell into the governing hand of Athens and then Sparta. Alexander the Great arrived in 333 BC and had a bit of a tussle with the inhabitants. The Romans took over the place and it remained important during the Byzantine era, finally the Selcuk Turks ruled from about the 13th century. We had a short lecture and then set off by ourselves to view the ruins which are very widely scattered. Aspendos has, it appears from the books, the most perfectly preserved theatre in the Roman world, built during the reign of Marcus Aurelius. Apart from the decoration of the stage wall the theatre is virtually just as it was when it was first built. Many of the front seats have the names of their occupiers on them. 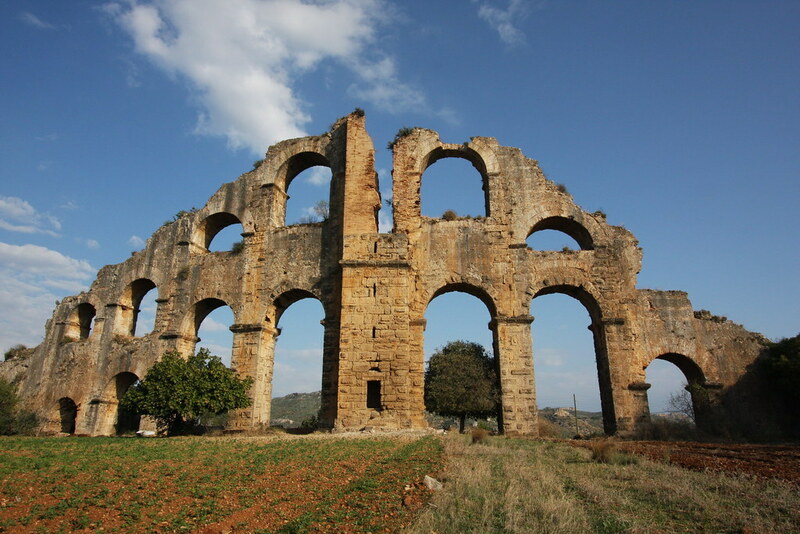 One of the other most spectacular buildings is the aqueduct, probably 2nd century AD. We ambled around the site looking at the various ruins, and suddenly realized that it was very hot and it was time to return to the coach and back to the ship for a delightful tea and a nap before dinner. Cyprus. The ship sailed all night and we arrived at Limassol on the island of Cyprus the next morning. Went by coach to see the ancient site of Curium or Kourion. This beautiful site is situated on a promontory some 300 feet above the Mediterranean. The most important remains range from the Hellenistic to the Byzantine era. We visited the complex called the Sanctuary of Apollo, first built late 8th century BC but the very pretty remains are dated to the 1st century AD. 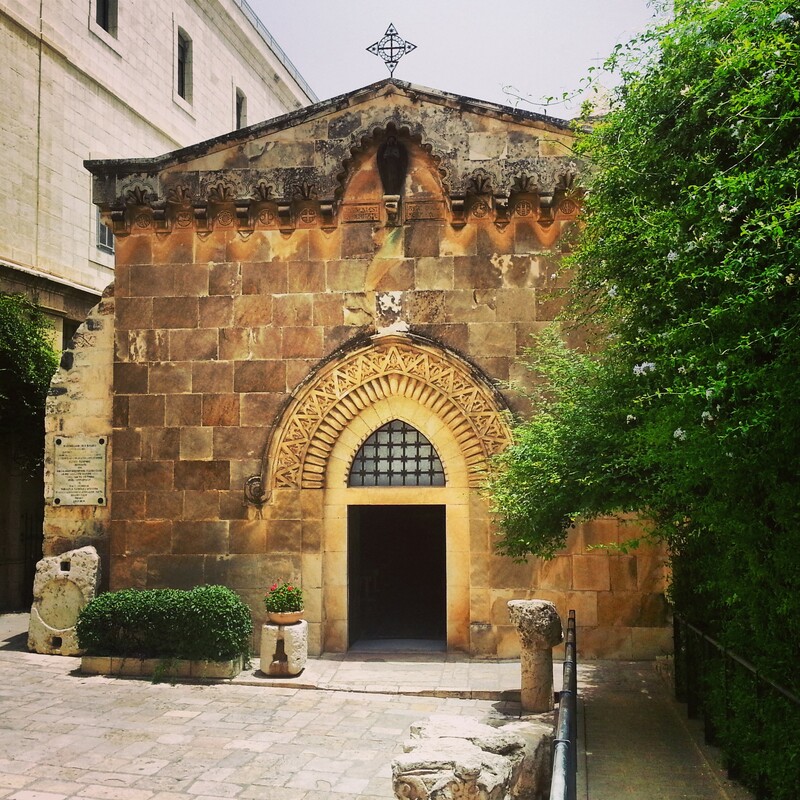 It was one of the chief religious centres of Cyprus and shows all the buildings which were attendant to the cult, hostels, baths, chamber for offerings, etc.. The theatre which has been wholly restored for modern use is 2nd century BC and has the most stunning view out to sea. It would be far too distracting to watch anything. 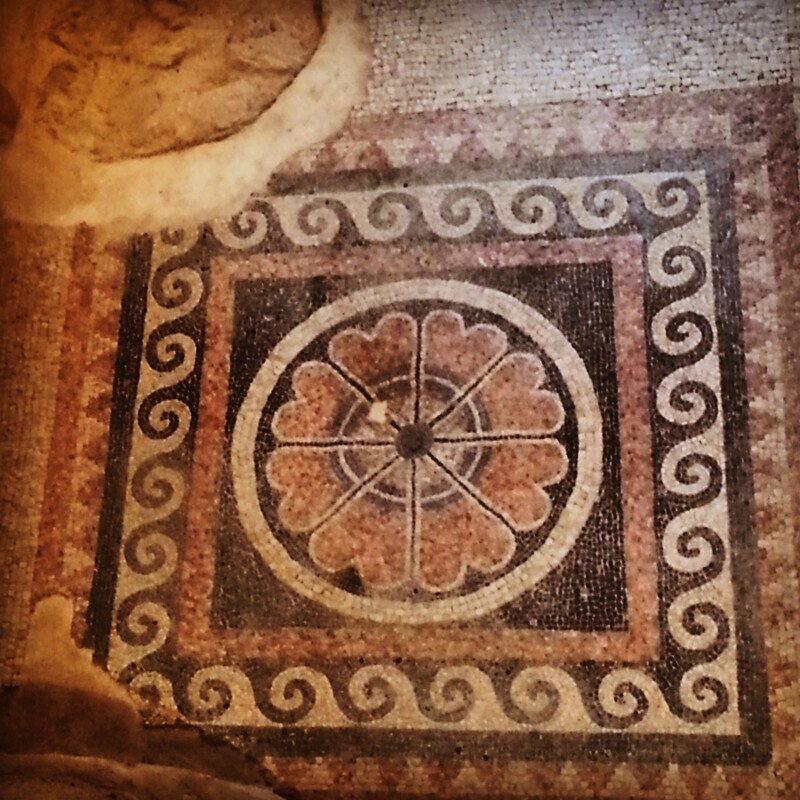 The mosaics in some of the houses in Curium are displayed including one of gladiators. The stadium still has its starting line set up between two posts, to accommodate about 8 runners. We then coached to Paphos to see the mosaics at the House of Theseus and the House of Dionysus. The House of Theseus has a mosaic showing Theseus killing the Minotaur. The Dionysus house which is a sumptuous Roman house of the 3rd century AD contains the Triumph of Dionysus with the god sitting on a chariot drawn by panthers. The tales of Pyramus and Thisbe – see Shakespeare’s A Midsummer’s Night Dream. Apollo and Daphne and many others. Pyramos and Thisbe with leopard holding in his mouth a piece of Thisbe’s clothing. And a delightful one of Phaedra sighing over her stepson Hippolytus who is provocatively posed in front of her, stark naked wearing only his boots with a cloak over his arm accompanied by his dog whilst on the right corner cupid having done his work on poor Phaedra is just sneaking off with a smile. Note the little shadows at their feet. Absolutely delightful. We returned to the ship in time for tea. Wonderful day. That evening we had to collect our special Israeli Landing Cards as the ship set sail for Ashod and we were due to visit Jerusalem the following day. and continued to the Shrine of the book (Dead Sea Scrolls) which were discovered in 1947-57 in 11 caves in and around Wadi Qumran. The shrine houses the Isaiah scroll (2nd century BC) the most intact of the scrolls. We then proceeded to the Dome of the Rock to view the El Aqsa Mosque (1035), the third holiest site in Sunni Islam. When the Crusaders captured Jerusalem in 1099, they used the mosque as a palace . Its function as a mosque was restored after its recapture by Saladin in 1187.
and see the Wailing Wall. The wall was originally erected as part of the expansion of the Second Jewish Temple by Herod the Great. The place bristling with armed soldiers. We climbed those famous steps to the Dome of the Rock to visit one of the finest examples of early Moslem architecture, dated 691 AD. The mosque was built on the site of the Roman temple of Jupiter Capitolinus, which had in turn been built on the site of Herod’s Temple, destroyed during the Roman Siege of Jerusalem in 70 CE. The building was severely damaged by earthquakes in 808 and again in 846. The dome collapsed in an earthquake in 1016 and was rebuilt in 1021. Further restoration work is recorded for 1027. Very cool and tranquil with breath-taking tiles. According to some Islamic scholars the rock is the spot where the prophet Muhammad ascended to heaven accompanied by the Angel Gabriel. The Jewish tradition is that this is the rock on which Abraham was to sacrifice Isaac. Why the Jews should venerate such a rock when the whole story is one showing a quite disturbing incident whereby his god commands Abraham to sacrifice his own son, by slitting his throat and roasting him, which he is apparently quite willing to do, lights a fire, ties the child up, etc., and is stopped by an angel from doing so at the very last moment with the blade about to descend on poor Isaac’s throat He is then praised for his willingness to murder his son in expiation of his own crimes. Talk about child abuse. One wonders if Isaac was traumatized for the rest of his life. Yes, well, there is the rock for all to see. But it is the beauty of the interior which occupies the eye and mind and the silence and coolness. Beautiful, particularly when you think of the contrast to all the guards surrounding the place, bristling with guns. 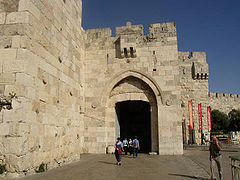 We then had a buffet lunch at the Ariel Hotel and then went to St Stephen’s Gate, one of seven gates in Jerusalem’s city walls. We walked along the Via Dolorosa, visited the Church of St Anne. , During the Roman Period a pagan shrine to the Egyptian god Serapis, stood on the site. 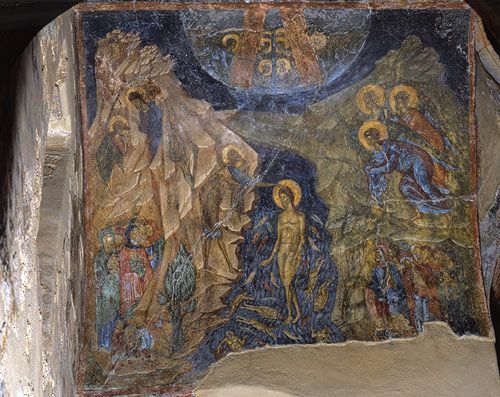 The church was built sometime between 1131 and 1138, during the reign of Queen Melisende to replace a Byzantine church. the Pool of Bethesda. We could not make head or tail of the site. Chapel of the Flagellation. Originally built in 1829, the current chapel was completed between 1927 and 1929 and was a complete reconstruction of the original shrine, where it was (mistakenly) believed Christ had been flogged by the Romans before going to the crucifixion. The Church of the Holy Sepulchre, supposedly the original site of the tomb of Christ. The Roman emperor Constantine I, a convert to Christianity, had the temple of Venus in Jerusalem demolished to make way for the church.The original church was totally destroyed in 1009, after a colourful history it was burnt to the ground in 1808. It was filled with so much bewildering gaudy rubbish that we were glad to leave the place. and returned to our hotel for the night. What to make of it all. The Mosque was certainly the highlight and absolutely beautiful, the churches seemed tatty, noisy and vulgar in comparison and very forgettable. Masada. The next day we set off by coach for Masada and stopped off at Qumran (of the Dead Sea Scrolls). 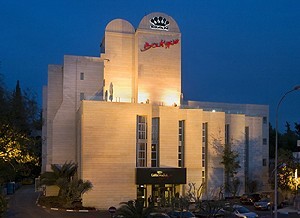 The home of the Essenes where the Dead Sea Scrolls are reputed to have been written. At Masada we were taken by cable railway to the top of the Masada site. What a godforsaken place. To think that throughout the day and night slaves were made to walk up and down the mountain bringing water, food and all the other luxuries required by the Herodian court. Herod the Great built palaces for himself on the mountain and fortified Masada between 37 and 31 BC. When Masada was overrun by the Romans the rebels, consisting of some 960 people, committed suicide. The site of Masada, showing the incredible ramp on the right which the Romans built to conquer Masada. Appalling heat in summer and equally appalling cold in the winter. What a terrible life the slaves must have had and presumably a very short one. An extraordinary sight was seeing the vast earth ramp built by the Romans which they used to finally conquer Masada. Can you imagine what that cost in terms of lives. The heat was intolerable, but the site was fascinating. Mosaic in the Western Palace, Masada (below). On our return we stopped to view the Dead Sea and finally the rather splendid ruins of the Hisham Palace, a Umayyad winter palace just north of Jericho. We had lunch at Jericho and joined the ship at Haifa. Gournia. The following day Saturday 27 September we spent at sea, with a round of lectures and lazing about. and on Sunday we arrived at Aghios Nikolaos on the Island of Crete and disembarked for a trip to Gournia. 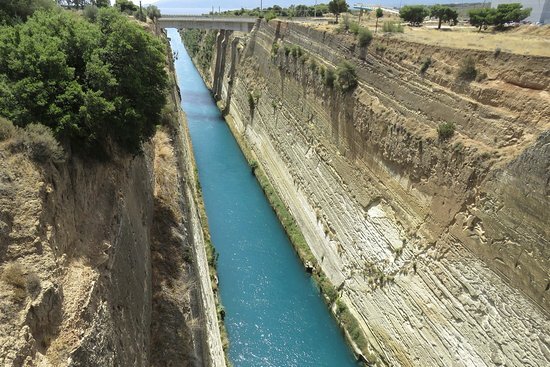 The following day, our last, we packed and arrived at Praeus on the Greek mainland and took a trip to Mycenae stopping at the Corinth Canal (1881-1883). We had seen Mycenae before but it was still as exciting. The remains of the palace at Mycenae. From there we drove to Athens airport and returned home. The abolition of the GLC. Pensions. A law was passed by the Thatcher government to abolish the GLC. My personal problem was how was I was going to be affected by the abolition. Clearly I would be leaving the GLC, so I looked at our pension/redundancy rights which were specific to the GLC and had been fought for over the years by the Union. These rights were contained in a massive tome which had been heavily amended over the years but had not been reprinted for some considerable time. The terms set out in the made it absolutely clear that indeed, even at my age, as I had served 30 years in local government, I would be entitled to a pension. My relief was short lived as the next thing I discovered was the Government had also read the terms and, appalled at the generosity of those rights, were quite prepared to tear up our contracts of service and give a standardised right to all local government officers affected by their local government shakeup, irrespective of what rights they may have under their own terms of employment. The next blow was delivered by Ken Livingston and the GLC Union. The Union announced that they would not negotiate with the government on the matter. There was to be a policy of no negotiation or communication of any kind to seek to ensure that we retained our rights under our terms of employment. In fact I attended one staff meeting called by Ken Livingston where he threatened the staff by saying anyone found communicating with an MP on the matter of redundancy and its implications would be instantly dismissed. I doubt he had the legal power to do so but I bet he would have had a jolly good try. Many members of staff in a similar position to me who had worked for local government for 30 years but were not over a certain age would therefore lose their pension rights and would have to wait till they were 65. Those over a certain age, I forget now what the magic age was, were definitely going to be entitled to a full pension, I discovered that most, if not all members the committee who ran the Union were over the magic age and would all be going off into the sunset with their full pensions and therefore were very comfortable with the situation of none negotiation with the Government. Needless to say there was some ill feeling engendered by the Union’s stand which was fully supported by Livingstone and a special meeting at the Friends Meeting House in London was held by the Union to explain their stance and to test the water. I think the hall was full to capacity and the support for the Union’s stance was roared to the ceiling. I had decided to speak at the meeting against the Union’s stance and put my name down as one of the speakers. I had never before spoken in public so was terrified. Anyway I prepared my three-minute speech, which was all that was allowed, helped by a close colleague Sylvia Marder, who was herself entitled to a full pension so had no axe to grind, particularly as she was a strong Labour supporter. I felt I needed to speak on behalf of those of us who would be losing our pension rights under our terms of contract if we did not negotiate. So when I was called and I was almost pushed to my feet by Sylvia. I gave my speech and was constantly interrupted and booed to the rafters, I can still see her standing, clapping and giving me encouragement. I could hardly read my speech with the interruptions. I never did finish it, as my three minutes were up and I went back to my seat, with, I hope, my head held high amid the boos and catcalls. The decision not to negotiate was virtually unanimous. Peoples hatred for Thatcher and her government, which I also shared, seemed to overrule everything. However, I think that some people in the audience must have realised for the first time that in fact they had rights which they did not realise they had, because they had not, like me, read through the massive book of rules that made up our terms of contract, rules which benefitted the staff like themselves, and which had been fought for by the Union over many years of negotiation with the Council. A month or so later, the atmosphere had begun to change, and I think many members of staff began to realise what rights they would be losing. Again the Union was obliged to hold a meeting, and again I wrote myself a three-minute speech, supported and urged on by Sylvia Marder. She looked over my speech and tightened and strengthened its wording considerably. Her absolute enthusiastic championship and backing was a great support. She insisted on sitting next to me in the hall and holding my hand, I have to say I was terrified of being booed and hissed again. This time I delivered my short speech with a little bit more force. This time I was cheered and booed to the rafters in equal amounts. There was such a noise I could not finish and when my time was up the chairman asked me to stop. Members of the audience shouted at the chairman to let me finish as I have been interrupted so often by the audience. I did and could see the Union chairman was none too pleased. The decision not to negotiate, was passed but not with such a resounding majority this time. However, events were about to take place which made negotiation unnecessary. Other Councils having read our generous terms decided that they would amend their rules to bring them into line with the GLC. The government got wind of this and, I think it was Kenneth Baker, who made a statement in the Commons that the Government would not recognise any new terms of contract which were approved after this date and then happily went on to say, quite unnecessarily, that of course they would approve all terms of contract entered into before that date. I often wonder whether Mrs Thatcher once she knew the implications of that statement, gave Mr Baker a smack. Baker’s speech was published in Hansard which I had followed daily. Not one person on the Union committee or staff realised the implications of Baker’s speech until I brought it to their notice and of course they immediately got on to the bandwagon to broadcast it as though it was all the Union’s doing. What a relief, all was now well and I would get my pension. However, I had not realised that, of course, the London Residuary Body needed knowledgeable staff like me to carry on the work of winding up the GLC’s affairs. My subsequent years with the LRB carried me into the age for full entitlement to a pension. All my concerns had been in vain. As a postscript, one day when I was walking along the South Bank with William, a man, who I did not recognise, came up to me and shook me warmly by the hand and with tears in his eyes, actually thanked me for fighting for his pension rights. His services had not been required by the London Residuary Body and he would have had to wait till full retirement age before he got his pension. He had apparently seen me at the Union meetings when I made my little speeches pleading with them to negotiate. He said that until he heard me speak he did not realise that he was entitled to a pension. Anyway I explained that the final resolution of the matter had not been in my hands but he insisted on thanking me anyway. He said he had had great difficulty in finding a job and the pension had been a godsend for him and his family. I was touched. He then said he would like my name and address as he knew his wife would like to thank me also. I said he had thanked me enough. It’s strange how some good things you do or in my case tried to do for almost selfish reasons, actually have a positive affect on other people’s lives.